Earlier this week, I wrote an article for Keith Collantine's F1 Fanatic entitled "Why Lewis Hamilton Should Be Champion". At one point I did claim that Hamilton deserves to be champion through his almost faultless driving this year and that sparked the inevitable debate about whether any driver can be said to "deserve" the championship. In one sense, they all deserve it. They have worked extremely hard to be able to compete in F1, given of their best, mostly in cars that stood no chance of winning, and some have done all this for far less money than Hamilton has received even in his rookie year. Some would say that Ralf Schumacher, for instance, does not deserve to be a champion but I would disagree; Ralf has had incredibly bad luck this season but, when his luck holds, he is quite capable of finishing as well as Trulli. He may have lost his edge over the last few years but he remains competitive and works as hard as any of them. To say that one driver deserves the championship any more than the rest is like saying that only one employee of a company deserves to be paid at the end of the month. All have worked hard for their wage packet and it may just be luck that decides one person's sales figures are better than another's. So yes, in a way, all F1 drivers deserve to be champion. But that is not quite the way we are using the term in this context. In considering the three drivers left with a chance of the title this year, it is inevitable that we should compare their performances and decide that perhaps one has made more errors than another, whereas the third has personality flaws that suggest he would not be as worthy as the next guy. What we are trying to do, in fact, is to form an opinion based as fairly as we can on the facts as we know them. Personal preference is bound to have an influence, however, so that some will say that Kimi's deadpan personality means that he would be an almost invisible champion, mumbling the required corporatespeak and not allowing us to see the real man underneath. Others might think that his monosyllabic responses would actually be an asset if he is declared champion, enabling him to avoid the controversies so easily sparked by a chance remark in the pressurized world of F1. Ultimately, it may be best to ignore the matter of personality altogether and limit ourselves to a consideration of the drivers' performances on the track. Many would deem the one who wins the most races as being the most deserving but I think this is simplistic and dismissive of too many other factors. As an example, how about the driver who habitually drives at or beyond the limit, entertaining us with spectacular stuff and winning sometimes but otherwise finishing his races in the tire barriers? Does such a driver deserve to be champion purely because his steadier and more sensible rivals split the remaining races between them? I think not and must insist that consistency and race craft should have as much influence on our assessment of a driver's performance as pure speed. And on their performances this season, Hamilton stands out as being as fast as either of the other two and a good deal more consistent. I don't like that any more than you do. I would much rather say that Kimi is twice the entertainment on track than Hamilton will ever be; but the truth is he was lacklustre in the first half of the year and we were all wondering where the old Kimi that we knew had gone. I thought, too, until fairly recently, that Alonso was a better driver than his team mate, in spite of his errors when under pressure at times; but then I watched Hamilton's qualifying lap in China and realized that he has produced similarly perfect laps in race after race, and this in his first F1 season. He is at least on a par with Fernando and will get better with experience. Today both Bernie Ecclestone and Jackie Stewart have said that, in their opinion, Hamilton deserves the title more than the other two. Although I'd rather have Kimi win it, I have to admit that they are right. I agree that Hamilton should be the winner based on the overall scope of the season, but I think that Kimi deserves it more. I disagree that 'all drivers deserve the championship', I believe all driver deserve there hefty paychecks, as there job in dangerous and always in demand.... Who knows how long they will be able to collect those pay checks. The reason I say that Kimi deserves it and The Ham does not is because, outside of Monaco, Kimi is behind in points because of his luck, something he has no control over. Hamilton is leading partly because of luck, but he is also very skilled. If you were to give these two drivers the equal number of DNF's then Kimi would clearly be leading. In other words although Hamilton is very skilled and will be around for a very long time (hopefully) if you take away his luck, he is only second best. Of course another reason we would say someone deserves something is due to the amount of blood sweat and tears someone pours into something they love and want. Obviously Kimi wins this argument based purely that he has been around longer. So when all is said in done, Hamilton will be very lucky to win this championship (assuming he does).... Its all the ones hes going to win in the future that he will be deserving of. I've always had difficulty with the "deserving" thing. Plenty of drivers deserved to win but didn't, some who have won were said to be undeserving. 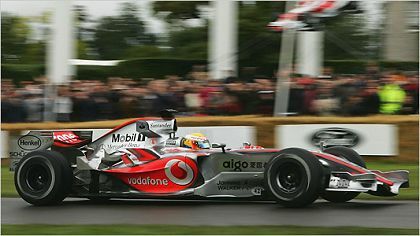 I have to admit Hamilton had a superior car (as did his teammate! ), made fewer mistakes, and considering he'd never seen a lot of these tracks before (sorry, computer games aren't that sophisticated or everyone ages 8-40 would be vying for a F1 seat) if he takes it, he deserves it. If he doesn't take it he probably still deserves it. I'm a fan and it isn't my job to keep personal feelings out of it. I'd prefer to see Kimi win. I haven't really been a driver fan since Prost retired the first time but this year and last seem to have changed that. I'm evenly divided on Alonso & Hamilton. I really like Alonso and, maybe this year has taught him politics are not his strength. Neither are head games. He's too literal for either. The thing about Hamilton is, I have no idea what I'm going to think about him next season or 5 seasons from now. It has nothing to do with the hype or that he's nice or evil or whatever. Hell, warts and all I loved Schumacher from day 1-except for a brief period when he started whining about other drivers trying to kill him. Oh, yes he did. Rich coming from a guy who drove like there was burro muerto strapped to the front wing. I do think Alonso is a marginally better racer, than Hamilton. It may down to experience but I think he's got more instinct. Or maybe Hamilton's just going to turn out to be a more subtle driver, like Prost. The real revelation in 2007 for me? Massa. Hands down. He hit some bumps (pressure, emotion whatever) a few times but that car was a little quirky from track to track and I never expected him to place as high as he did this year. Maybe he'll deserve something next year. I think you have something there when you liken Hamilton to Prost, Verasaki. It's struck me several times this year when Hamilton has been putting in a fast lap that he doesn't look fast - he has such a smooth, undramatic style that his lap times always come as something of a surprise. Prost was just like that. Alonso is all flair and style, however. He has precision but somehow he looks quicker than other drivers. Perhaps it's a slightly different line through the corners or a twitchiness in the car but somehow he seems more dramatic than Hamilton. And normally I would prefer a driver like that - it's just Alonso's public statements that have let him down this season, I think, not his driving. It's much easier to comment on who will win the championship after it has mostly been decided, fuel cooling debate notwithstanding. There was a time when the worst (two? three?) results were not considered when figuring the championship points table. This provides for several things, including removing blemished performances when the car just didn't work, and also provided a buffer in case a driver becomes injured. As much as recklessness ought to be a part of motorsport to a certain degree, I think we all know F1 will not introduce any rule change that would cause car components to be destroyed more than necessary (unless in the interest of safety) and that alone would prevent such a provision from going back in. As far as feelings go, I'm fairly convinced that both Ron Dennis and Jean Todt are untrustworthy crooks. I don't want to suggest that McLaren installed fuel coolers on their opponents' cars, but the "top" teams have been way too quick to win their championships in arbitration instead of on the track. It gives me a new admiration for teams like Spyker and Aguri, but begs a new question- was there a single team this year that was neither accused another team nor was accused by another team of a rule infraction? I suppose this is a "he that has no sin" situation. This one made me think, Chunter. It's an interesting way of putting it - that drivers had to drop two or three of their worst performances in a season. The system was (sometimes - it's been tried and dropped again several times) that drivers could only count a certain number of their scores in a season. So in a season of say 14 races, they might be allowed to count only twelve results and would drop their worst scores (or DNFs) accordingly. The effect is just as you say, of course. I don't follow your reasoning regarding destruction of components, however. Why should limiting the number of scores eligible for the drivers' championship lead to less reliable cars? Surely the teams would still strive to finish every race so that the retained scores were as high as possible? As for Dennis and Todt, I see you're of the "pox on both their houses" school. There have been times when I, too, have felt that way this season and I am glad that it's over now, apart from the minor matter of some cool fuel. Here's hoping that 2008 sees a new mood of acceptance that things should be decided on the race track, not in the court room. The reason why being aloud to discount low scores can lead to less reliable cars is because there is no longer as much incentive to preserve your car. It will also be easy to recognize who must race conservatively based on how many DNF's a driver has collected. Ah yes, I see your point now. And, seeing that the FIA are now talking about engine freezes for ten years, you're quite right that they are hardly likely to consider such any measures that reduce the drive to reliability.